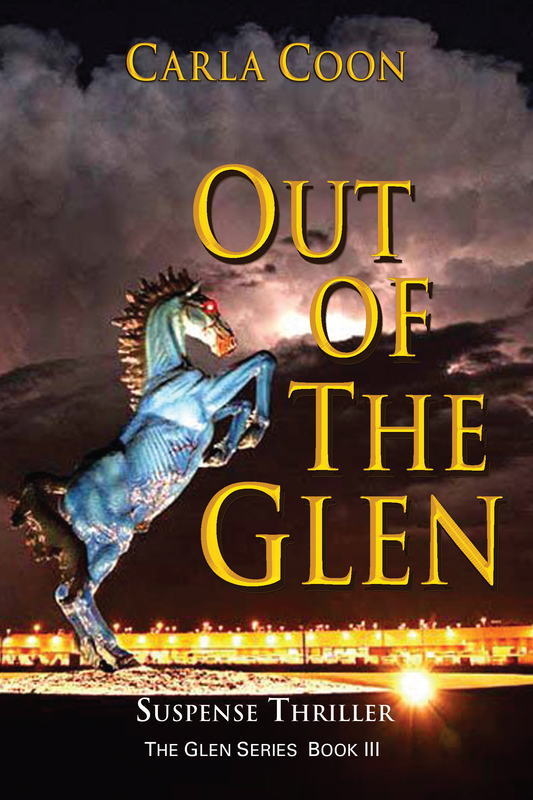 It concludes the Saga of Jackson Miller and THE GLEN. Prologue Clyde Cleans Up APRIL 22, 2007 Early morning fog lay heavy and damp as John and Clyde hiked silently down the forest hill. Clyde concentrated on the organic scents of damp earth and rotting leaves, something honest and real. For hours, John and he had rested by the invisible curtain of the Glen, awaiting the dawn, till they could see their way through the thick woods. Clarice’s spirit had left them. Clyde knew this as he could no longer see her light. Both he and John had watched Rachel, or rather Angela, John’s sister, disappear behind the Glen, lost to them in the mist with the Miller’s little boy, Jackson. The two continued amiable but quiet, until John stopped short. Clyde, almost colliding with John’s broad backside, beheld what was left of his Mother’s home. The cabin lay in a shredded mess of wood and beams with the roof lying atop it as if the explosion had popped it off whole and plopped it back down on the splintered remains. Without words, both men began at opposite ends, digging through the layers. Clyde noted the forest scent replaced with an acrid smell of charred wood and gas. They tossed one board after another over their shoulder, till John yelled,” Here!” Clyde clambered over the rubble towards John, who held up a hand. “You sure you want to see this?” “It’s my mom,” was all Clyde could manage. John’s lips tightened and he gave slight nod as he opened a hole to what was once the basement. He reached for a large board and gingerly lowered it to form a makeshift ramp, over which they both side stepped to reach the corpse. John left Clyde alone as he knelt by his mom. Her body, arms and feet were covered in blood where the knives had pinned her to the wall. Clyde shook his head at the memory of how she’d hung there, her arms and legs wide apart there like a flying squirrel in flight. He became aware of John digging nearby through more boards, looking for the other body of the man called Sergio. The man’s death was such a shame, Clyde thought, sitting back on his haunches, when all the guy had done was to try to protect Rachel…, er, Angela. Clyde guessed he might always think of her by the fake name she’d first given him. For Sergio and for his mom, Clyde thought, God’s will was best. He closed his eyes and prayed for their souls even though he felt sure his own mom had gone straight to the arms of her Maker. “But you always taught me to pray for the dead, Ma.” Clyde leaned down close to his mother’s face, removing some debris. “You even prayed for Mother Theresa and Pope John Paul, didn’t you Ma? So don’t you worry none; I‘ll pray for you like you wanted, and for this man, too.” The sound of John tossing board after board ceased. Clyde glanced up seeing John’s head and shoulders yanking and tugging something that was likely the body of Sergio Valenti. “I can’t talk long, ma,” he said, smoothing the scraggly grays from her temples. “I just want to say how sorry I am for what we have to do, leaving you here.” Clyde looked over again towards John then back to his mom. “John says it’s best, to leave you here in your house,… er,” he looked about at his grandfather’s cabin, nothing but toothpicks and this stone basement after the gas explosion. “Anyhow Ma, I’ll be asking God for help so someone comes and finds you. John says —” “Clyde,” John spoke low, coming behind Clyde and placing a hand of his shoulder, “I’ll be up there looking for the other bodies.” “Those, those two? The man from the casino and that wo-woman who killed Ma?” “Yes, Clyde, We have to remove them as well. No one associated with the casino can be here or you might get in trouble” John spoke as he climbed the ramp then turned back to peer in the hole. “ Take your time, but not too much, kay? I need your help to lift this guy over that ramp and into the car.” Clyde nodded a few too many times. “I know you are right. I—I just want to say goodbye to her.” John offered a grim nod and turned away. Clyde turned back to his mother with tears in his eyes. “I just love you, Ma. I’m gonna miss you something awful, you know? I will be good and do everything you taught me. I…I,” He could say no more although he knew he would always talk to her, and she would hear him just as the Lord does. With that, he called to John, who had already located the other bodies. They finished hauling the one called Sergio up and dragged him to the trunk of the white Lamborghini , where John had already laid the woman, who was in two halves, the sight of which almost caused Clyde to throw up. The sickly metallic smell of blood wafted up as John and Clyde tossed the corpse with an ax still buried in his skull on top; this Clyde recognized as the man from the casino. No more dark aura surrounded those two now, and Clyde felt pity for them, sure that the dark had claimed their immortal souls. The bodies had to be shoved this way and that to cram them in the small trunk. John looked about to pass out at one point; he turned placing a hand over his mouth and paced forward almost to the shed before turning a few circles, composing himself and returning. He gave a giant heave to the legs still protruding and slammed the lid down. For the one called Sergio, John did most of the heavy lifting. They debated where to put him. He would have to either go in the passenger seat of the lamb or be wrapped in a tarp or something and laid in the back of the Blazer. John finally decided on the former as macabre as it was saying only that he did not want the body in the Blazer. They found an old army blanket in the shed, and arranged the body in the passenger seat, and covered it. “Thank God for tinted windows.” John said handing keys to Clyde. “You drive my Blazer, I’ll drive the hearse.” “Where?” “Follow me, I know a deep pond. I hiked to it once when I was on a build. It’s not far off of 81.” John quickly described a spring fed pond, saying it was as good a place as any, whether authorities discovered it, or if it lay at the bottom of the pond, the rotting corpses and rusting Lamborghini would hurt no one since the spot was nowhere near any housing or water supplies. More than an hour later, the sporty white hearse bumped over a fieldy terrain and stopped in front of a black pond. After wiping it down and weighting the pedal to the floor with a rock, John jammed the steering wheel in place with a branch Clyde had found. Leaning in, he threw it from Neutral into Drive. The Lamb shot forward, occupants and all, making it just past the center of the reedy pond, before the last sliver of white top slipped beneath the inky water. John blessed himself, staring after it, and Clyde stood with his hands in his uniform pockets, fiddling with John’s keys. He handed them to John as the two turned their backs on the pond, hoping not to see it in their dreams. John drove Clyde over an hour back to his apartment near the casino. It was decided that Clyde should show up to work as if nothing had happened, and that is just what he did. It wasn’t possible for Clyde to lie, so instead it was hoped no one would ask him the right questions. The deaths of the manager and two security guards had thrown the casino hotel into an uproar and sure enough, no one questioned Clyde’s comings or goings. As tired as he was, now going on 37 hours with no sleep, he managed to keep his ear open for all the scuttlebutt. He learned the search was on for the white Lamborghini, Vera Wheaton and Emmett Pierce, who were under suspicion of murder. All the hotel security tapes had been erased, but personnel were being questioned all day. None had seen Clyde’s earlier flight with the missing maid and the bodyguard of Emmett Pierce. Housekeeping assumed the maid had just quit. And in the chaos, no one had even noticed Clyde’s being absent all afternoon the day before. Clyde knew it was because they considered him slow and some even called him special. It took him all the way through high school before he understood what people meant by that. But Clyde wasn’t special, except that he could see lights and darks over people’s souls sometimes, but they didn’t know about that. He was slow, he knew. He took his time with words. He like to consider them before speaking. And when he was upset, he sometimes stuttered. With work he considered himself careful, not slow. A thing should be done right or not at all. That was what his dad and grandpa taught him. Well, it seemed funny to Clyde that he knew so much about what happened and no one bothered to ask him. Three weeks later two policemen came looking for Clyde. They cornered him by the elevators and then escorted him to a bench by the fountains in the atrium outside the casino floor. He was a hair’s breath from admitting everything when the taller one said, “We’re, uh, so sorry to have to tell you this, but there’s been a terrible accident.” They went on to explain that they were unsure when the explosion and fire had occurred, but that his mother had been tragically killed. It took them a little sleuthing to locate him, they said, and they were extremely sorry that the body had already been cremated since they could not locate him. He could pick up her remains at the mortuary in Ithaca and arrange there for her burial if he decided. An estate lawyer found Clyde next, and confused the tar out of him, trying to figure out the deeds to his mom’s property, it’s worth, and if Clyde owed any taxes on it. The lawyer also questioned whether Clyde might be compensated for the gas leak or charged for the explosion. By the end of the week, Clyde had quit his job and took a bus to Ithaca. He was sleeping in the shed on his Mother’s property in a sleeping bag when he heard a knock at the door. The story of his plight made a small paragraph in the local newspaper, which tidbit caught the eye of Gerard Healy and his little prayer group. Clyde was surprised but in no time, he decided they were ‘good eggs’ as his mom would say. They had Father Tom conduct a burial service, interring his mom’s ashes in the same graveyard as Mrs. Nicestrum, where so many miracles had occurred. Clyde was pleased with that except that it was so far from him. But at the service, he saw strong angelic lights in the miniature graveyard and knew it was the best place for his mom’s body. After the burial, they organized a good ol’ barn-raising with volunteers working every weekend for two months on his mom’s land. They cleared the rubble, saving as much wood as possible. They sawed trees and planed them the old-fashioned way, using tools his dad and grandfather still had in the shed. John Miller also leant them tools and helped get electricity back up, as well as dealing with the gas company, reinstalling new equipment. With his savings, Clyde was able to buy enough of whatever supplies were needed for them to complete a humble version of the original cabin. Clyde accepted his new friends and their interest with the same equilibrium he accepted mail or summer rain. He gave as easily as he accepted, and in no time, everyone in the little troupe counted on Clyde to help them with their own household repairs. Clyde found a new position as a janitor for a small private grade school in Ithaca. He was a huge hit with the children, who seemed not to mind his slow speech and openness. For Clyde, the younger children were refreshing as well. They got him and never questioned his honest intentions or friendly manners, the way adults often did. He and the kids got on in a fine way, and even missing his mom, all seemed right in Clyde’s world.